I will admit, the first time I ever made quinoa, I didn’t like it at all. I cooked it like rice with nothing added and it really wasn’t very tasty. Who cares if something is super nutritious if it tastes like sawdust? I am all about deliciousness first. But then I gave quinoa a second chance by adding some favorite flavors and now we are very good friends. Haven’t tried quinoa yet? Pronounced keen-wa, it’s a tiny grain (well, technically a seed) with a light, bouncy texture and a subtle nutty flavor. Quinoa’s claim to fame, however, is that it is one of very few plant foods with all 8 essential amino acids making it a complete protein. It is rich in minerals and fiber and is gluten-free. It is also surprisingly light and much easier to digest than many grains. If you and quinoa never really hit it off the first time, this recipe might bring the two of you back together. It is a great, easy basic with lots of flavor. The lemon gives it a nice kick and the cumin adds a mellow earthiness. I especially like quinoa with something crunchy, like nuts or a crisp vegetable. I think this recipe is perfect just the way it is, but my daughters always add feta to it (as pictured below, with their favorite kale salad.) If I haven’t convinced you yet, use quinoa in place of cous cous or orzo in one of your family’s favorite recipes, and I have a feeling you’ll be back for more. 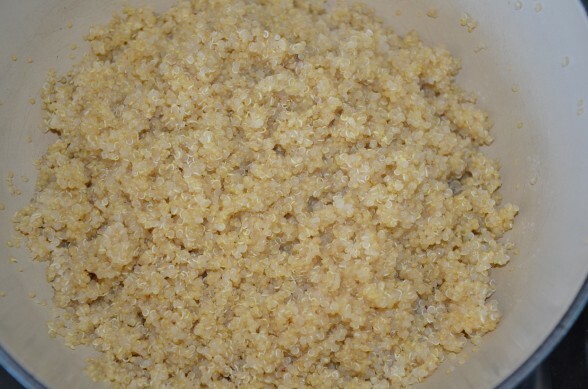 Rinse quinoa in a bowl with water or place quinoa in a fine mesh sieve and rinse under cold water until water runs clear. This removes the natural bitter coating on the grain. Transfer to a saucepan and add ½ teaspoon of sea salt and 1 ¾ cups of water. Bring to a boil, cover, and simmer until water is absorbed, about 15 minutes. Remove from the heat and let sit, covered, for 10 minutes. 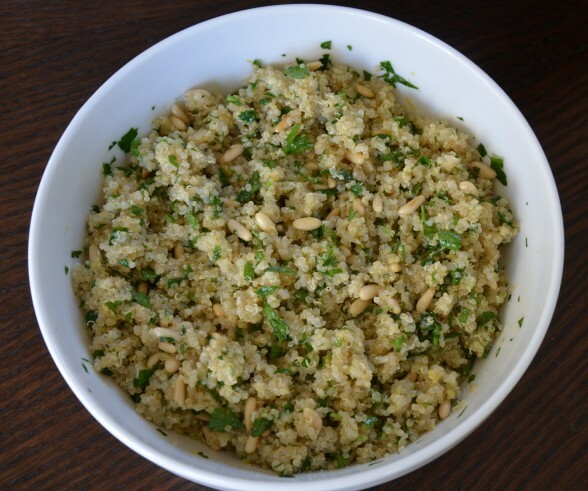 Transfer quinoa to a serving bowl and add pine nuts, lemon zest and parsley. In a measuring cup, whisk together cumin, olive oil and lemon juice. Add to quinoa and toss to combine. Taste for salt and pepper and season accordingly. Top with crumbled feta, if desired. Serve warm or at room temperature. Really tasty even the next day out of the fridge! So yummy, Pamela! Thanks for sharing. My niece is allergic to nuts so I had to omit the pine nuts. It needed something so I added raisins and it was fantastic! Perfect way to adapt this recipe! Yum! It really doesn’t work with the lemon juice. I used only 2T lemon juice and still tasted nothing but lemon. 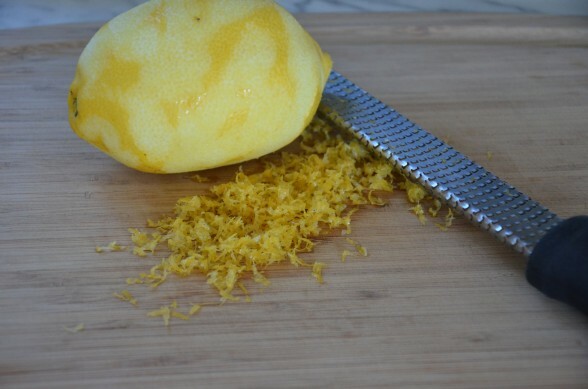 Suggestion: make it without and see if the zest gives you enough lemon flavor; if not, add juice slowly, maybe 1-2t at a time. 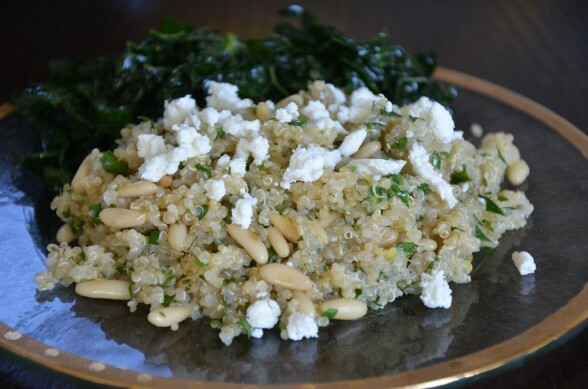 My sister (Dalia) introduced me to quinoa, your recipes and your website! I love quinoa now and have tried a couple of recipes including this one and my husband and I practically ate the whole thing in one sitting….delicious, nutritious and very creative! How nice of Dalia to send you my way. She’s an absolute love. Hope to see around the site in the future ;). Soooo delicious….as are all of your recipes! Do you have a recipe for quinoa cakes?? Thanks Rafaela! I don’t have my own recipe for quinoa cakes, but I saved this one onto my Foodily page: http://www.foodily.com/r/9TB1zexbWG-little-quinoa-patties Looks delicious! Hi! I tried this recipe and it turned out great 🙂 I love quinoa and have tried a couple of different recipes. Pine nuts are expensive, but they go very well with feta cheese and parsley. Yep, pine nuts are pricey, but you have other options that will also go well with feta and parsley that are less expensive. I like a little crunch with my quinoa so you can try sunflower seeds, pistachio nuts, chopped almonds or even diced carrots. Have fun with it! That’s great, Nancy! It’s a really versatile quinoa that I make all year long. Keep spreading quinoa love! I love quinoa! I buy white and red (crunchier when cooked I find) and mix the two together in a jar. 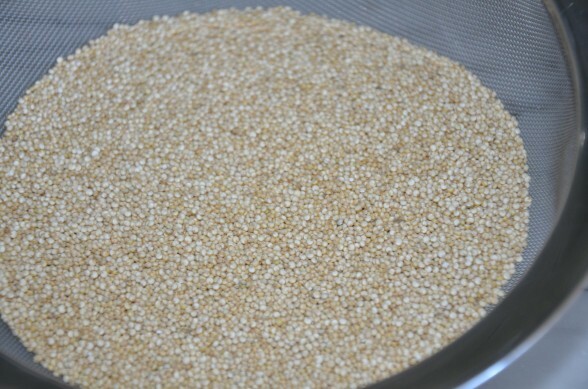 It is a great grain, ok seed, because it is so fast to cook like buckwheat/kasha, my two quick to cook grains. I too have them for breakfast, lunch, and dinner. I can’t wait to this version, maybe trying finely chopped soaked/dried walnuts or pecans, as I generally don’t buy pine nuts because they’re spendy. Thank goodness for quick-cooking grains/seeds! Yes, pine nuts are expensive, but I mentioned to Cristina that you can substitute sunflower seeds if you like. I really need to get back into the habit of soaking seeds and nuts. Thanks for the reminder! I just made your lemon and cumin-scented quinoa. It was so good! My family loved it too! It is full of flavor and has great texture. I highly recommend this dish! I eat quinoa for lunch two to three times a week, tossed with cherry tomatoes or kale and feta cheeese and sprinkled with olive oil, but this is way better. However I have a problem with the pine nuts; I only find them “from China” therefor I do not buy them. Any other nuts we can put in? You’re right about the pine nuts. Many that I find do come from China, but I have also found them from Spain and Russia. Otherwise, I would use chopped almonds or sunflower seeds that you toast and drizzle with a drop of olive oil and a pinch of sea salt. Looks delish!! Can’t wait to make it!!! This is a wonderfully delicious way to introduce quinoa. It is a very flavorful dish which is really quite nutritious but so easy to prepare. Quinoa has been a staple in our family ever since we tried this recipe.